Bosch Power Tools and Accessories launched the Litheon 36V 1671 6-1/2-inch Circular Saw. The new professional heavy-duty cordless circular saw is top of the category boasting 26% longer run time than the closest competition, the most power for tough applications and the industry’s most advanced lithium-ion battery technology, Litheon. Bosch engineers optimized the 1671’s motor with innovative Litheon battery technology to achieve 26% longer run time over competition. Combine category best power with 4,000 RPM and the 1671 powers through tough applications such as 45-degree bevel cuts at high speeds where others would completely stall and fail. Stepping up to any challenge, the newest Bosch cordless saw performs, looks and feels like the corded tool trusted by professionals for years. By utilizing Bosch Litheon 36V technology, professionals benefit from up to twice the run time of an 18V battery, Li-ion or NiCad. 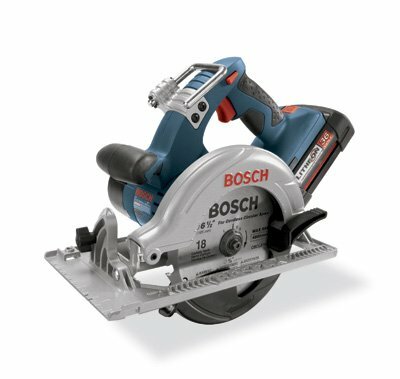 The 1671 is compatible with the innovative Bosch 36V Flexible Power System, which offers two separate battery packs to customize tools based on application. The 36V FatPack offers the longest run time for the most heavy-duty applications, and the 36V SlimPack is one pound lighter for easier portability and shorter projects, but runs up to 15% longer than 18V batteries. Either choice achieves the same end, professional performance.